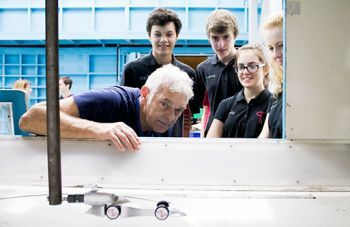 Team Tempest from St John Payne Catholic Comprehensive School, Chelmsford, tests the aerodynamics of its model car in City's Handley Page Laboratory before competing in the ninth F1 in Schools World Finals in Austin, Texas from 8-13th November. 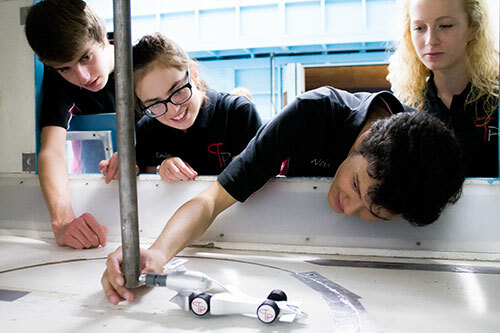 In preparation for competition at the ninth F1 in Schools World Finals in Austin, Texas (8-13th November), members of Team Tempest tested their model racing car in the wind tunnels of City University London's Handley Page Laboratory on 31st October. Team Tempest, from St John Payne Catholic Comprehensive School, Chelmsford, comprises a quartet of 15-year-olds: Emily Powell, Neil Buchanan, Jennifer Jardine and Henry Whittington. At stake at the Hyatt Regency Hotel in Austin is the much-coveted Bernie Ecclestone Trophy and an opportunity to win scholarships to study for an Automotive and Motorsport engineering degree at City. Students are given a brief to design a model compressed air powered F1 Car of the future using computer-aided design/computer-aided manufacturing (CAD/CAM) engineering techniques. Cars are then manufactured on a computer numerical control (CNC) machine. The cars race on a 20 metre track, with the cars covering the distance in just over one second, a speed barrier which is yet to be broken by any student team since it was set by Team FUGA from Northern Ireland at the 2007 World Finals with a time of 1.020 seconds. Each team of between three and six students brings together their portfolio of work to present to a judging panel with a verbal and written presentation to support their model car, which is raced on a specially-designed test track. At the World Finals, each of 39 competing teams from 23 countries, will have an opportunity to bring along a pit display, their cars and portfolio, as well as having prepared a verbal presentation for the judges. Team principal of the City Racing Team, Roger Valsler, says: "I am delighted that City is involved with the F1 in Schools programme. We are in an excellent position to showcase our excellent facilities and to assist youngsters to have a better understanding of the theoretical aspects of the syllabus they are following at school. It is great to see students who have come through the programme and who our now reading for automotive engineering degrees and working on the engine of our Formula Student car." "My period of study as an engineering student at City was key to achieving my ambition of working within F1 racing. Without that exposure I would not have had the key skills to progress in a world championship winning team. City is a major player in F1 in Schools and STEM education we hope that the students involved will one day become part of Formula One's future. If F1 in Schools existed while I was at school I would have jumped at the chance to take part. I would highly recommend the programme to school-aged children seeking an engineering education." Alongside City, other sponsors and supporters of this year's F1 in Schools include Circuit of The Americas, The Institution of Engineering and Technology, Autodesk and Austin Independent Schools District. Please visit the F1 in Schools official website for further information.